Can you outsmart Pittsburgh's first Escape Room? 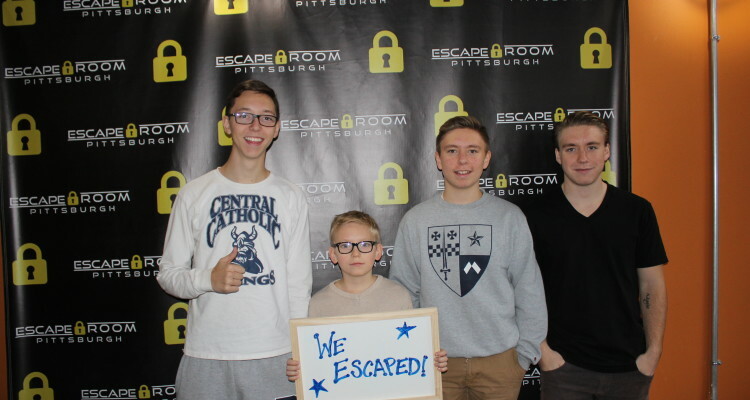 Ryan Deasy, Patrick, Mike and Steve Scabora make it out of the Escape Room. Can you outsmart Pittsburgh’s first Escape Room? Thinking out of the box can help visitors to break out of a room—an escape room, that is. And Pittsburgh’s first provides a mind-bending, brain-teasing thrill for guests. Part tourist attraction, part team building experience, Escape Room in Greenfield is a 60-minute clue-cracking challenge. Groups work together at solving 20 to 25 puzzles to find the key that will unlock one of two chambers—science-themed Dr. Stein’s Laboratory or jail-breaking-themed Prison Escape. To help with their mission, the teams of five to eight use clues, gadgets and everyday items. Smaller groups and individuals may be combined to form full teams when the schedule is full. It’s not scary, but rather what owner and developer Joe Deasy calls “a mind trick.” And there is no climbing or physical strength required. In fact, Escape Room’s building is ADA accessible. The approximately 25 x 25-foot rooms are equipped with tablets displaying the time remaining, points earned and, if necessary, helpful clues. But if the clues are used, points are subtracted. “We watch on cameras in the rooms from the front desk and will slip a clue under the door if the group inside isn’t progressing,” says Deasy. 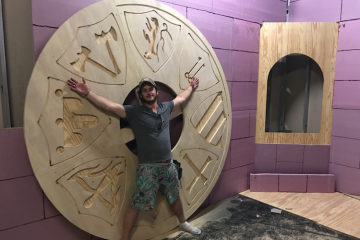 Making the experience a rush is the roller coaster of emotions throughout, explains Corey Dolan, 24, an ultrasound engineer who had never heard of the escape room concept before trying this one. He has entered both rooms, but his team successfully escaped from only the laboratory. “The idea of being locked in a room…,” he says, “You go from nervousness to anticipation, confusion and frustration. When you solve that first puzzle there is a surge of adrenaline. Most challenging is knowing where to begin. “There are a lot of things in front of you, and you think, ‘I know this goes to something else.’ You just start playing around and figure out what’s relevant,” he adds. “Even if you don’t get out, you feel good about yourself because you just solved about 20 puzzles,” says Deasy, who has a degree in computer science and digital media from Duquesne University. Deasy, 24, of Munhall, was impassioned with the idea after visiting an escape room in Budapest. Trendy in Europe and Asia, the rooms are just beginning to pop up in the United States in places like New York City and Miami Beach. “It just instantly hit me that there needs to be more of these in the U.S.,” he says. So he and his cousin, Corey Deasy, 32, of Greenfield, dedicated the better part of last year to gutting and renovating a family-owned building and tweaking clues with the help of about 100 individuals who tested the cousins’ plans. Andy Ondich of Ondich Electric was instrumental in designing and building many of the puzzles. After their grand opening in mid-December, Deasy says they have been booked solid, working 12-hour days throughout the holidays. And it seems just about anyone is willing to try their hand at code-breaking. “We started targeting a 20- to 30-year-old demographic, but have (hosted everyone) from 12-year-olds to 87-year-old grandmas,” he says.